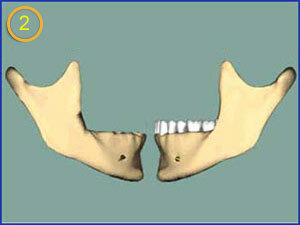 Take a look at the images below to see the progression of jaw bone shrinkage due to missing teeth. Here, we see the loss of bone height from a profile view. Note that as more bone is lost, vital structures – such as nerves – become exposed. 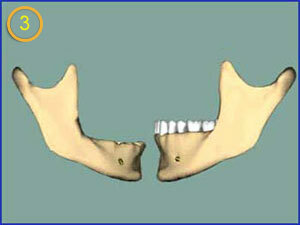 As time passes, the jaw continues to shrink, becoming thin and brittle, changing the shape and appearance of the face. When teeth are lost or need to be pulled, the jaw bone is no longer stimulated. 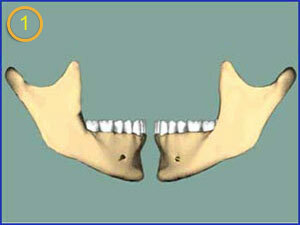 The jaw bone, not needed to support teeth, begins to shrink. 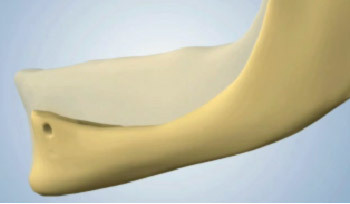 Advanced bone regeneration and bone preservation techniques can help preserve and restore the jaw bone, to make dental implant placement possible, even in cases of severe bone loss. In cases where the upper jaw bone has receded, the sinus cavity can drop into the space below. In these cases, a Sinus Lift can be performed to return the sinus to its proper location, and once again make placing dental implants possible. Come in for a free consultation to find out how dental implants can still be an option for you – even if you have experienced bone loss due to missing teeth. Schedule Your Free Dental Implants Consultation If you are missing one or more teeth, or if you are struggling with uncomfortable dentures, come in for a free consultation to find out whether dental implants can still be an option for you – even if you have experienced bone loss due to missing teeth. Schedule an appointment with an experienced New York City periodontist or NYC dental implants provider by giving us a call, or request a consultation online.